The Kiva MFI Checker has been around so long it deserves a preamble. 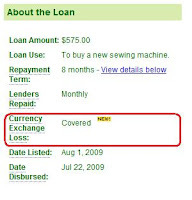 Originally conceptualized and created by Chris Means, of our team, it was a Firefox Add-on that allowed you to flag MFIs when viewing Kiva lending search results on the classic/old version of the Kiva lend page. Support for that Firefox Add-on is discontinued. A new slicker version of the Kiva MFI Checker has been created as a Greasemonkey script. If you don't know what Greasemonkey is, don't worry, there's instructions below on how to install everything. Meanwhile, as all that has occured on the Firefox front, another teammate of ours Radu has created the Kiva MFI Highlighter which is a Google Chrome extension that visually looks and works like a clone of the original Kiva MFI Checker created by Chris Means. If you still miss the old Kiva MFI Checker then follow the instructions below to get everything working in Google Chrome. The MFI Highlighter on the other hand is still maintained using your own custom list and that list can act either as a blacklist or a whitelist. These tools are in wide use amongst Kiva Lenders not just members of our own team. This brings one issue to the forefront how do we know if an MFI is religious or not? How do we know if an MFI carries a currency risk? To determine if a loan/MFI has a currency risk you just need to view the loan and go to the "About The Loan" section and there is a convenient field that lets you know if a corresponding MFI has an associated currency risk. To determine if an MFI is religious or secular there is no easy convenient way to know for sure. Each MFI description must be read and the corresponding MFI website (if any) must be thoroughly researched. In certain cases it can be difficult to make a determination. It would be nice if Kiva (when they have time, as it's not priority #1) could make a new field (or checkbox) where an MFI administrator labels themselves as religious or secular. 2) Install the Greasemonkey Firefox Add-On, click here. 4) Go to the Kiva.org Lend page, and you'll see a new "green bar" at the top of the page (just above the loan listings). The script defaults to the Religous list (as a Black-list), you can change it to use any preconfigured list (currently Currency Risk Sharing, and Social lists are also available), or if you only want to loan to Religous MFIs, make it a White-list. Radu from our team has created an extension for Google Chrome called the Kiva MFI Highlighter. 5) Click on the appropriate field partner name and click the Append button. Alternatively, you can copy and paste a list of MFIs. I have provided the list of Christian MFIs below. 6) Go to http://www.kiva.org/lend you will see the name of the MFI highlight if it's in the list. This is awesome. I had posted about Kiva to my local atheist group a while ago so I updated it with this tool. Are there any other religions like Islam with MFIs? Christians can't be the only religious group. Thank you for the list of christian MFIs. It saved me the legwork of doing it myself. I have been looking for a guide of this type. These are the organizations that will get my dollars. Thanks for this info. I just joined your same Kiva group (I am an atheist). I appreciate the utility of this application, but instead of looking at the religious affiliation of the MFI, don't you think it would be much more useful to see the interest rates that the MFI's charge to the people they give the money to? Many MFI charge 15, 20, and 30% interest, and others (some of which are religious) charge only a 7% interest. Isn't the purpose of our loans to help people out of poverty, one small loan at a time? I think that looking at the interest rates, instead of the religion affiliation, is a much better way to do it. Hattha Kaksekar Limited (HKL), a partner of Save the Children. Save the children and all of those created and related whith INTERMON OXFAM. "Feed The Children is a Christian, international, nonprofit relief organization with headquarters in Oklahoma City, Oklahoma, "
Hey, I'm the creator of the nuclearspike.com/kiva app (safe loan search) and because of the convos in the Atheist group, I've added the ability to exclude religious groups (not yet publicly released, but has started testing) and was hoping that your google spreadsheet docs also has the IDs so that I can easily keep my app in sync with the changes that happen with the dock. Your app is really cool, I've used it several times. I've modified the google doc to add the MFI IDs in the second column. Thanks for adding such a feature to your app, I'm sure many many team members will appreciate the feature. Please let me know when the feature is live on the Internet and I'll announce it to the Atheists et al Team. I'm upgrading a number of other features at the same time (and moving from Silverlight 2 to 3 which broke stuff), and unfortunately things are a little wonky at the moment (can't filter by clicking on the pie slices, the process sometimes stalls in the middle and the lender analyzer has to be run twice to get the second set of charts to populate properly). But feel free to check it out in the meantime -- but just be prepared for things to go weird sometimes. :) I'm leaving on a week-long vacation tomorrow, so it won't get updated for a while. Thanks for updating the list with the IDs, that will make things easy! Juanjo, is there a central list for the MFI's interest rates that is maintained? I would like to add that as an optional slider restriction when searching for loans in my app. I want my app's search features to have all the extra bits for those who are looking deeper than just country, sector or gender. It would be interesting to see the relationship of the partner rating to the interest rates, since MFIs crank the interest up to cover the loans that go bad to keep their defaults/delinq at 0% and 5 star... This search would work great to weed out a bunch... since currently many of my search features are all excluding loans/partners from the same direction, to make things better for the lender... I would like to add things that make things better for the entrepreneur as well to find those in the sweet spot and reward the MFIs that don't gouge. Cool, but this should really be a greasemonkey script, not an extension. That way it would consume less memory and be less prone to slowing down firefox. I have an update to the nuclearspike Safe Loan app. In addition to other upgrades, you can now optionally remove religious MFIs as you search for loans. 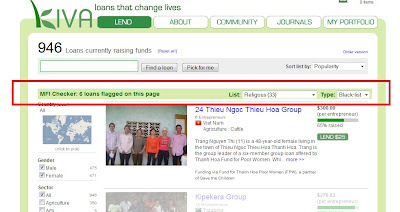 In addition to being able to remove religious MFIs, Kiva Bank now lets you filter down to only the MFIs listed in the Social MFIs spreadsheet listed on this blog. Also, due to the attention on Profit and Interest charged to the borrowers that the NYT article brought, it also now has the ability to select the ranges of profit and interest that you consider to be fair and only look at matching loans. Step 6 appears not to work anymore as described - the format of the table does not allow copy/pasting into the application. From a user point of view it would be nicer if the list was in app, or if the app could load the list from a URL. Great list and great effort putting it together. I actually just made a loan via an MFI on this list before I came to this page (ugh), but now I'll know for the future. Could there be people seeking loans in a region where all MFI's are religion affiliated? If I knew this I would consider loaning despite the affiliation. I wouldn't want a country to be filtered out by this criteria. I can't get the Grease Monkey script to install. When I click the install button nothing happens. Other scripts work fine. It is just this one. interesting to see atheists behave like religios fanatics, this is exactly what a lot of members of organised religions would do, only donate to people who agree with their religions views, so well done. Another thing, this site was founded by a Christian, so maybe atheists need to further segregate their clan away from everyone else and set up their own site, so religious people are not involved in any way shape or form to their "do goodness"
I'm an atheist, but if the founder of Kiva is a Christian, I don't really think it matters. Hmmm, the checker doesn't seem to be working in FF 10.0.2. I can see the green bar no problem but it's not blacking out any posts. I've got Firefox 11, and it doesn't seem to work. It's not working for me. It seems to be there and all, it just won't do anything. I'm not sure how your determine some of the less obvious MFI as religious, but I could not find anything on Koperasi Mitra Usaha Kecil (MUK) which indicate it is religious or religiously affiliated. Thank you so much for the list.. I've been looking for a list of Christian organizations that I can donate to! It's amazing how God has always (and continues) to use unbelievers to bring glory to His kingdom. Thank you Lord!